Jerilyn Cox is an intern with Samaritan’s Purse in Haiti. 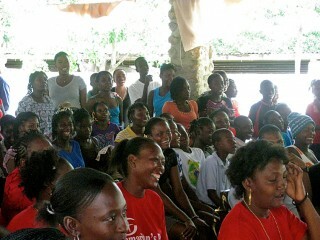 Excitement stirred in the Haitian afternoon heat as the group of women in red T-shirts began emerging from the back room wearing costumes and carrying props. They giggled and whispered to each other as the audience waited for what would happen next. 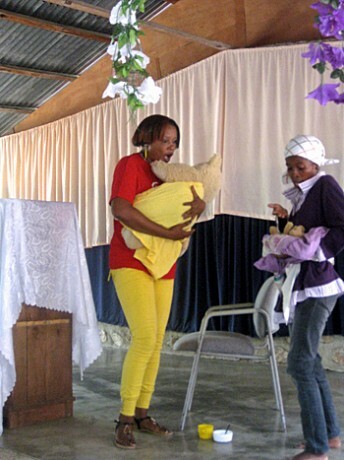 A woman dressed in a purple shirt and white headscarf took center stage as a “set in her ways” mother with a sickly, underweight baby represented by a small teddy bear. She sat down and began caring for and feeding her baby improperly. The next woman who entered carried her robust looking child, represented by a large stuffed bear. She looked aghast at the small baby and began to question the mother about the infant. The community health workers use skits to illustrate their points. “Oh, no! I don’t do that,” replied the mother in the headscarf. “No! No vaccines,” she answered with a dismissive wave as the mother with the healthy baby looked shocked. “Ehh, none of that,” retorted the mother. The playful gleam in her eyes hinted at the fun she was having with her acting role. Community health workers who are being trained by the Samaritan’s Purse Maternal/Child Health program performed the skit. They attend classes on different topics relating to the health of mothers and young children and are equipped to share that knowledge with their neighbors during individual home visits. The program works to dispel cultural practices that are harmful to babies and replace them with better practices to decrease the infant mortality rate. Skits are a fun way to teach mothers important lessons about their children’s health. I love working with this program because of my passion for public health and preventative approaches to health care. 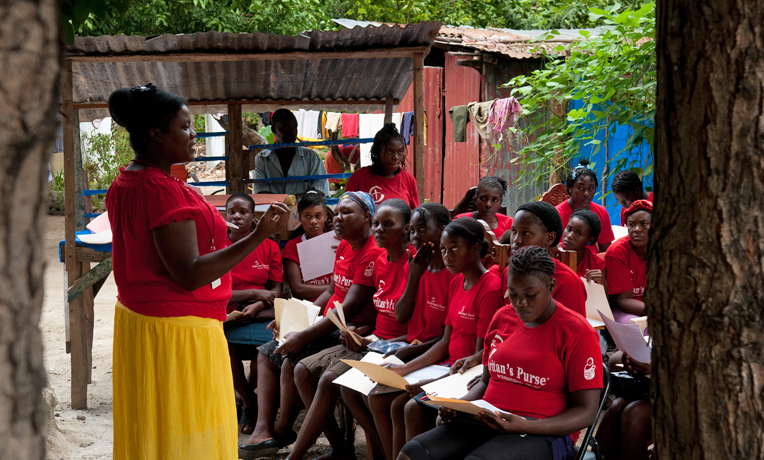 The knowledge that these community health workers will be able to share is vital to the health of the rising generation in Haiti. The next time you hold your healthy child, attend a baby shower for a friend, or play with your nieces and nephews, please remember the women and children of Haiti and consider joining in this valuable work to change the future of Haiti. Find out more about the Samaritan’s Purse internship program here.